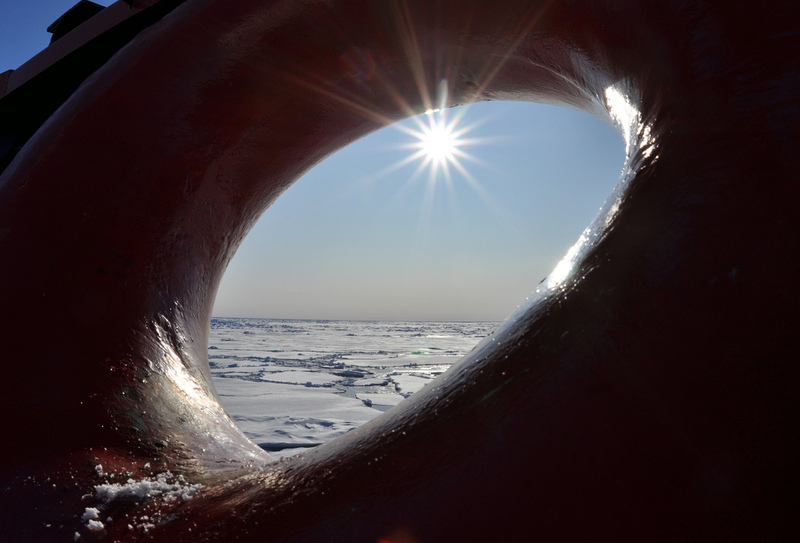 The sun shines through the bullnose of the Coast Guard Cutter Healy on the Arctic Ocean Sept. 1, 2009. "All students graduating from this degree program should KNOW..., BE ABLE TO..., and BE PREPARED TO..."
Once a department has established its collective vision and direction, the next step is designing or re-designing degree programs that move the department forward in that vision. The goal is to develop an integrated, coherent, and comprehensive program or set of programs that addresses the needs of the whole student in their pre-professional training. 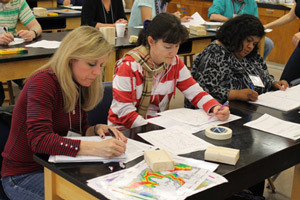 Thinking across the whole program includes curricular course offerings and opportunities but also elements from the co-curriculum, such as department field trips, geology clubs, and campus academic support services. The program vision encapsulates the purpose and goals of the program with respect to the students it serves. It provides the rudder that steers implementation and evaluation of success. If a department only offers a single degree program, then the program vision and the department vision are the same. But if a department offers more than one degree program, each one would have an explicit vision such that, together, all the programs move the department's vision forward. What the right number of programs is and how they work together to fulfill the department vision are questions that the department needs to answer based on their own circumstances, but examining mission and vision statements from other departments can help frame the contours of these decisions. What do you want students to be able to do? Every member of the department will their own perspective on this question. The challenge for the department or program is to develop a set of collective vision of these goals. At a meeting or retreat, spend 5-10 minutes getting faculty and staff to individually write out goals for their students on individual sticky notes. What should they be able to do when they graduate? What should they have experienced? The Ideal Student Exercise can be a good way of "priming the pump" ahead of the meeting. Then everyone puts their notes onto a board and the group organizes the whole set into clumps. Synthesizing what the notes in these clumps have in common can point the way to "goal-like objects" (GLOs). Discuss the suite of GLOs in the context the department/program vision. Do the GLOs reflect the department's context and strategic foci? Do they collectively serve the range of students that you serve today and want to attract in the future? the current state of your program; what courses are being taught, in what sequence, and to what extent do they currently address your goals. 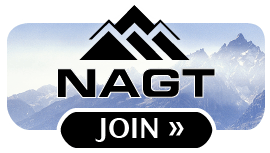 what is needed in your program in the face of emerging new directions in the geosciences, expectations of the modern workforce, and institutional requirements? how program elements beyond the curriculum help students develop the expertise you envision for them. Once you have constructed a program matrix with your "goal-like objects," you can use it to guide the assessment of program-level goals and outcomes. You can analyze your programs as they are and see how well they align with the goals the department has developed. Does what you have "work" and how does it relate to what you, collectively, want? Constructing assessable program-level learning outcomes also means that end results can be measured and lead to ongoing program assessment. AMS, 1999, Bachelors Degree in Atmospheric Science. Bulletin of the American Meteorological Society, v80, p475-480. This statement describes the minimum curricular composition, faculty size, and facility availability recommended by the American Meteorological Society for an undergraduate degree program in atmospheric science/meteorology. Buchwald et al., 2001. Robustly Useful Ideas as Geology Department Planning Tools. The Carleton College Geology department found that identifying "robustly useful ideas" helped them to set priorities for their curriculum and related programs, as Ed Buchwald explains in this short article. College of Exploration, US Geoscience Literacy Frameworks. Overview diagram showing the relationships between Atmospheric Science, Climate, Earth Science, and Ocean Science literacy frameworks developed by geoscience educators. 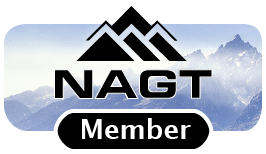 This page includes links to each of the geoscience literacy frameworks, as well as to a list of themes they share. These frameworks provide an integrated, less abstract approach to science literacy, with natural links to contemporary environmental issues. Council of Undergraduate Research, 2007, Developing and Sustaining a Research-Supportive Curriculum: A Compendium of Successful Practices, edited by Kerry K. Karukstis and Timothy E. Elgren. This publication shares successful practices that enable faculty and institutions to design, implement, and sustain a research-supportive curriculum. Drummond, 2001, Ten Principles of Geoscience Departments, Part 1, citation and bibliographic information. This column by the editor is the first of a two-part exploration of ten common principles among geoscience departments. It is intended as a conceptual framework that departments can use to think strategically about the strength of their academic and administrative positioning on their campus. This first part deals with five academic issues. Drummond and Markin, 2008. An Analysis of the Bachelor of Science in Geology Degree as Offered in the United States, Journal of Geoscience Education, v. 56, n. 2, p. 113-119. This analysis of degree programs in the U.S. provides departments undergoing program review a basis for comparison with other institutions and national norms. Kelso et al., 2001, A Geology Program Revised, citation and bibliographic information. This article describes a survey which the authors conducted to ascertain the views of geoscience faculty as to what concepts, teaching methods and courses should be considered the core of the curriculum. Loudin, M., 2004, Where in the World Will We Find Our Future Geoscientists? : One Employer's Perspective, Eos Trans. AGU, 85(47), Fall Meet. Suppl., Abstract ED31B-0748. In this poster from the 2004 AGU Fall Meeting, the author lays out the hiring situation in the petroleum industry and how geoscience departments can benefit by turning out graduates with the skills oil companies need. National Resource Council, 1995, Reshaping the Graduate Education of Scientists and Engineers, citation and bibliographic information. Recommendations are aimed at creating a new PhD that would retain the existing strengths of the current system while substantially increasing the information available, the potential versatility of students, and the career options afforded to them by their PhD education. This is an excerpt from the report of The Boyer Commission on Educating Undergraduates in the Research University. In this excerpt from their 1999 article in Change, the authors argue that there are fundamental, structural problems with the system of graduate education and that any real reform effort will have to go well beyond the initiatives that have been tried so far. Williams, Warner, and Warner, 2004, Subject-Area Knowledge Measured by Scores on the National Association of State Boards of Geology (ASBOG) Fundamentals Examination and the Implications for Academic Preparation, Journal of Geoscience Education, 52(4), 374-378. Link to abstract and downloadable full text.